I wanted to introduce myself: I live in the suburbs of Charlotte. I used to do a lot of historical costuming/reenacting. I unexpectedly found myself in need of a set of generic Jedi robes for something, and some friends told me about y'all's tutorials. I am the sort of perfectionist that if I am going to the trouble of making a costume, I want to do the best job I can. 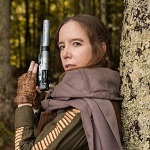 I am still wavering on whether Rebel Legion is right for me*, but every time I see people from RL and the 501st at events around town or at Dragon Con, I get serious itches to start sewing again. I have other ideas for what I'd like to do down the road, but want to start comparatively simple. *If anyone is in the Charlotte area, I'd be happy to meet you for coffee/ice cream/pizza/whatever to talk more. Welcome to the board. I don’t have a Jedi costume but I do a bunch of events around Charlotte with my R2. Hi, and welcome! I am in Wilmington, so a bit far for coffee, but I'm going to try to hit up some cons there this year. Maybe we'll see you there! Welcome! I am in Cary but am happy to help field questions. Please let us know if there's anything we can do to help you. You'd mentioned tutorials and resources. In addition to the stuff on the forums, there is a Facebook group for people building generic Jedi for RL here - https://www.facebook.com/groups/412450279152900/ - and they probably also have tutorials and such that could be useful. I live in Indian Trail and work in Ballantyne. I'm not very active in the legion so I may not be the best person to field question but I'd be willing to if you want.. Thank you, everyone! I look forward to meeting you eventually! Im in Greensboro, but troop in Charlotte pretty regularly. I have a Generic Jedi and Im currently making an Ep3 Obi Wan, so please feel free to message me with questions regarding materials and what not.